It is strange that the Po Valley should be linguistically so uniform, in view of the repeated barbarian invasions to which it has been subjected. From its western extremity at the base of the Alps in Piedmont to its easternmost limit, where it joins the slopes of the Carso near Monfalcone, it is inhabited by a population which, except for slight anthropological differences and dialectal variations, shows how the language and civili zation of Rome unified races of divers origins. After the Gallo-Italian dialects, such as those of Piedmont, Lombardy, and Emilia, come those of Venetia and Friuli; yet they are all dialects of Italian and are dominated by Italian as a language of culture. The only traces remaining of medieval foreign occupation are to be found in the place names; and even these are scattered and insignificant, with the exception of a well-localized group of Slavic names in the plain of Friuli west of Udine. Except for this latter region, which furnished the highroad for the foreign invasions, the great Po Valley, even in the centuries of Italy's greatest depopulation, possessed enough civilized inhabitants to assimilate the people who came from outside, often in great masses but always without sufficient support from new arrivals. The valley might be held for centuries by foreign peoples, but they were always sure to be more or less rapidly fused with the native population. Very different, however, were the vicissitudes of the Alpine district which flanks the Po Valley. Here natural conditions prevent a dense popu- lation and an uninterrupted settlement. The thickly populated districts are confined to the valley bottoms and to the slopes with favorable exposure. The Alpine peoples, of whatever origin, may have been able partly to escape from Celtic influence but not from that of Rome. In antiquity they, like the peoples of the plain, were almost completely Latinized. There is evidence of this in the series of Alpine dialects which with slight inter- ruption extends from the Grisons to Friuli — dialects differing among them- selves but regarded by linguistic experts as constituting a single group called ^^Ladin." Some of these peoples call themselves ^^Ladins," while others call themselves ^^Romansh"; both terms are reminiscent of the civilization of Rome and at the same time are living indications of its con- fines. Today, however, these confines are no longer what they once were. The place names show that the Ladin territory included a great part of eastern Switzerland and of the Tyrol, Vorarlberg, a great part of Bavaria, Salzburg, the Pustertal, and other territory which is now German. It used to include also the Julian Alps, now in great part Slav. It appears certain that the population of the Alps, already sparse in ancient times, became still more sparse during the early Middle Ages, whereas the Germanic and Slavic peoples experienced that great increase which was the indirect cause of the violent migrations toward the Medi- terranean countries and of those slower and more continuous movements of expansion by which their present distribution in Europe is chiefly explained. Almost all the great barbarian invasions were directed at the regions of Italy which were richest in treasures accumulated through the ages. The Alps could only prove a temporary resting place for peoples who were seeking passage by the easiest and most accessible routes. So these inva- sions had no direct influence upon the ethnography of the Alpine territory but only an indirect influence due to the havoc they wrought along their path. Of far greater importance were the varied colonizing movements which took place in the wake of the great barbarian invasions for centuries. This colonization was accomplished by groups that were numerically small but were often renewed during the long periods of time involved; they found the conditions favorable for a secure settlement in the midst of the sparse Alpine population. These movements lasted until the thirteenth and fourteenth centuries, and in some cases even longer. They were often favored by feudal lords who desired to populate abandoned territories and who were unscrupulous about the people among whom they recruited colonists. It is well known that in the Middle Ages the Alps were less a country of feudal castles than of hospices and convents. Even before any concep- tion of nationality was developed, the abbots and bishops, were the natural upholders of the Koman element, while the dukes, counts, and marquises — almost all of German origin — were certain to favor the German element. Nevertheless, in many of the ecclesiastical estates German colonization pro- ceeded without hindrance and in some cases with encouragement. This is explained in part by the fact that the Italian element had no settlers to furnish, and in part by the fact that the Germans alone possessed the knowledge of some special craft, such as that of mining. At the eastern end of the Alps the Franks granted lands in the plain of the Tagliamento to the Slavs, while later the Patriarchs of Aquileia admitted to their territory groups of German settlers. All this shows that we are dealing here with phenomena explained by geographic, economic, and social factors which were more weighty than the desires of the governors. In several particulars the German colonization of the Alps differed from that of the Slavs, among others in the greater role played by agriculture and various arts and trades as compared with stock-raising, and because in general it was later and continued longer ; there were, too, some territories in which the Germans came and settled in Slav colonies. The movement of the Slavs toward the west began at the end of the sixth century and was arrested by the Bavarians in the Pustertal and by the Lombards in Friuli. But these combats were probably against the first bands of robbers, behind which came the peaceful stream of colonists, not numerous, but sufficient to populate completely Styria, Carinthia, Carniola, and parts of Friuli and Istria. The Italian element with which they came into contact in the latter regions showed a remarkable power to assimilate the Slavs. But only in a few cases could it offer an effective resistance. A considerable resistance was offered, however, by the German element, especially in Carinthia. In the eighth century the German colonists had begun to establish themselves in force among the Slavs, who were evidently much scattered, so that Carinthia and northern Styria were already in the twelfth century largely populated by Germans or Germanized Slavs, as were also later central Styria and the greater part of the basin of Klagen- furt. This diffusion of the Germans over territory once Romanized and later become Slav took place on the southern side of the Alpine watershed only in a few cases, as in the upper valley of the Fella (at the source of this river and at Pontafel) and in the basin of the Isonzo, where, however, the little colony of Deutschrut, imported by the Patriarchs of Aquileia in the fourteenth century, has now become Slovene. 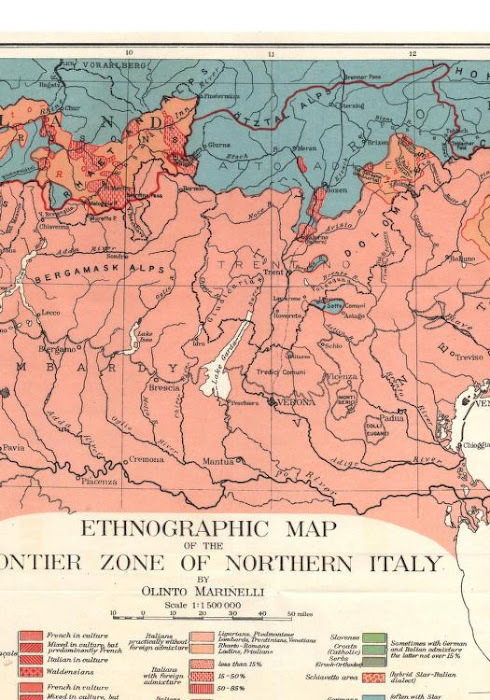 There have been many cases on the other hand in which German coloni- zation passed beyond the Alpine watershed, pouring directly into Italian territory. The most notable is certainly that of the upper Adige region; but from the Monte Rosa massif to the Carnic Alps there is a whole series of German peninsulas and islands in Italian territory. On the other hand, around the upper Rhine and the upper Inn (Engadine) the Ladin element is still found on the northern slope of the Alps. Thus, when the line of the Alpine watershed is considered in relation to the limit between the German and Italian peoples, it is easy to see that a coincidence is quite exceptional. It is evident also that the medieval colonization of the Ger- mans followed sometimes the highroads from the trans-Alpine countries into Italy and sometimes secondary paths and difficult passes; wherefore it is not always easy to see a close relationship between the topography of the Alps and its ethnographic conditions. We must now examine separately each of the territories with a mixed population. They are almost all outside of the political state of Italy, the greater part of them lying between the boundaries of the kingdom and the Alpine watershed. Since this watershed is conventionally regarded as the natural boundary of Italy, these territories are generally considered as outskirts of Italy under foreign rule. To some of them Italian geographers have given special names which differ from their official or political names and sometimes even from their traditional names. **Venezia Giulia" (Julian Venetia) , for example, has been used by Italians for some decades to designate the region which the Austrian government calls the Klisten- land, together with parts of Carinthia, Carniola, and Croatia. The southern part of the Tyrol south of the watershed, on the other hand, is called the ^^Trentino'' (i. e. the Trent district), a comparatively old name, and the northern part ^'Alto Adige'' (i. e. the basin of the Adige above Salorno), a name only recently used, at least in its present acceptation. The terms *^ Italian Switzerland ' ' or ''Swiss Lombardy" and the name ''Nizzardo'' (i. e. the district about Nice) have no need of special explana- tion. Almost none of the regions here mentioned has any geographic unity, since their extent is dependent on the often irrational position of the political boundary of Italy in relation to its so-called natural boundary. Most of these districts result from an aggregate of diversified territories or parts of territories which often have had no common history and have now no administrative unity. Almost all are territories conquered at the expense of Italy, when for centuries it was divided and weak. These conquests usually find their geographical reason in the interest which the Alpine or partially Alpine states had in securing for themselves the possession of the roads which led down into the Po Valley by occupying the passes and southern Alpine valleys. The states in the Po Valley — strong because they were rich in population and civilization^ — were the states which, although usually at war among themselves, saved Italy from total subjection to the foreigner and later rendered possible its unity. 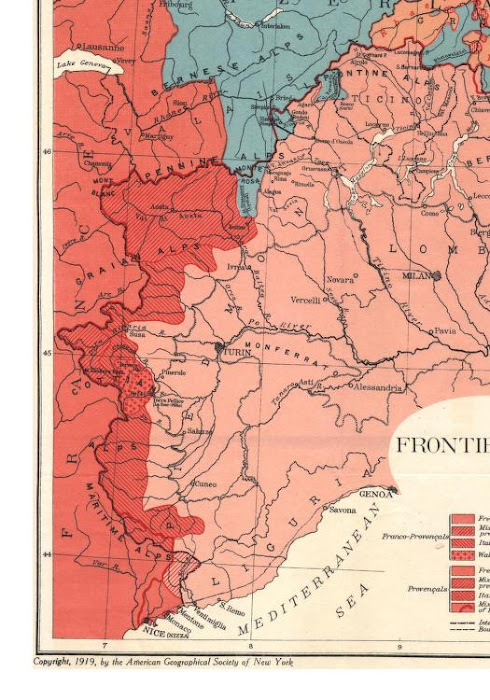 The extension of the trans- Alpine states to Italian territory was facilitated by the fact that the Alps are not every- where a difficult obstacle and that their divide is not everywhere clearly defined. The line is most undecided at the eastern extremity of the Alpine chain, in the Carso, where most of the watercourses flow partly under- ground and where none of the various relief features have a decided character. The Carso, indeed, presented serious difficulties to railroad con- struction, though not requiring long tunnels, but it always offered easy access to the old forms of transportation and to great masses of migratory peoples. The population which established itself in the Carso did not feel that isolating influence exercised in the Alps by the high mountain barriers separating one valley from another. Moreover, even in the more rugged parts of the Carso the anthropogeographieal conditions in some respects approach the conditions in the plains, while in other respects they are distinctive. It is precisely in the region of the Carso that the occupation of Italian territory by foreign peoples has reached its widest extension. Here, in Julian Venetia, we find the greatest aggregation of diversified territories and the greatest ethnic complications. Julian Venetia includes, besides a part of Carniola and a smaller part of Croatia, the upper Fella valley, the Gorizia district (i. e. the County of Gorizia and Gradisca), Trieste, Istria, and Fiume. The upper Fella valley was never under the rule of an Italian state ; the County of Gorizia, after the extinction of its ruling house, which was feudally dependent first on the Patriarchs of Aquileia and then on Venice, passed in 1500 by inherit- ance to the House of Austria and has belonged to it ever since; inland Istria, for similar reasons, had previously undergone the same fate, while the seacoast belonged to the Republic of Venice until the Treaty of Campoformio (1797) ; Trieste in 1382 placed itself beneath the protection of the Dukes of Austria in order to have their support against Venice; Fiume in 1483 through inheritance came under the same dominion, but in 1778 was handed over to the Hungarian Crown. Julian Venetia includes Alpine territory (the Julian Alps), foothills (Julian Pre- Alps), plateaus (the high Carso) and high plains, and a piece also of real plain (eastern Friuli). It cannot be considered in its entirety, but only in the separate parts into which it is traditionally divided. Istria is the most notable part of Julian Venetia. Administratively it includes the islands of the Quarnero (Veglia, Cherso, and Lussin) and excludes Trieste and Fiume. The islands of the Quarnero can be considered as belonging physically to the archipelago of Dalmatia, while Istria finds its physical unity mainly in its peninsular character. Istria resembles a typically Italian region both in its physical features and in the human occupation of its soil, especially its arboxiculture. An even stronger impression of being in Italy is made upon the visitor by its cities, both by their monuments and the general appearance of their buildings. Art and culture are everywhere entirely Italian. However, the ethnographic conditions of Istria are complicated. In few regions could there be found a more mixed population. The whole peninsula was Eomanized in antiquity, with the result that there became established, in the north, upon a Carnic foundation, a Ladin dialect, which has only recently disappeared, and, in the south, upon an lUyrian founda- tion, a Venetian dialect, the Istrian of today. In the seventh century there arrived from the north the Slovenes and, a little later, from the east, the Croats. They were chiefly shepherds and only later became tillers of the soil. The Italian population of the cities, located mainly on the coast, maintained itself almost everywhere and in a great part of the region was strengthened by the rule and civilizing influence of Venice. But for various economic and social reasons Istria, in the fourteenth and following centuries, underwent a depopulation. To repair this the Eepublic of Venice favored colonization by outside peoples, principally from Dalmatia and Albania. The ethnography of Istria is, in large measure, the product of this immigration, which took place in the fifteenth, sixteenth, and seven- teenth centuries, and which was directed both toward the inland districts and to those parts of the seacoast remaining unpopulated. The last of these colonies (1657) is that of Peroi, near Pola, settled by people from the Bocche di Cattaro region and by Montenegrins, who still preserve their Greco-Oriental religion. This colonization, which continued more than two centuries, strengthened the Slav element in the interior and introduced it in the Italian cities of the west coast. It also brought Kumanians, the greater part of whom, however, are now Slavicized, their original language being preserved by only a few hundred people in two small districts in Croatian territory. The Slavicized Kumanians are the so-called Cicci (Chichis), who inhabit the most mountainous part of Istria, the Fucki, and perhaps some other stray element, which, in the past, fused with the Italian. It is worthy of remark, however, not only that many of the Slavs of Istria use Italian as their language of culture and commerce, but also that some hybrid dialects have been formed, as is the case with the so-called Schiavetto. The last century brought, on the one hand, the strengthening of the Italian element in the coast cities, thanks to the assimilation of the unedu- cated Slavs and to the immigration of laborers from Friuli, and, on the other, the extension and consolidation of the Slavic element in the country and in the interior. The latter phenomenon may be due to the greater fecundity of the Slavs, their absorption of the Eumanian elements, or their increased spirit of nationality, as a result of which some bilingual popu- lations which in the past considered themselves as Italians today regard themselves as Croats. Later, in the interior of the peninsula, which did not belong to Venice, there was added the German element, which during the feudal period had difficulty in securing a foothold. In very recent times it has become somewhat numerous in a few seaside and winter resorts such as Brioni and Abbazia and at Pola. From being a small town, which a century ago numbered less than 1,000 inhabitants, Pola has become the largest city of Istria, with 60,000 inhabitants, since its transformation into the chief naval port of Austria-Hungary. The other coast cities of Istria had little modern industrial and commercial development. This enabled them to preserve their Italian character intact, in their architecture and their language as well as in all the manifestations of family, civil, and artistic life. It is difficult to determine with certainty the distribution of the popu- lation of Istria according to language, even within its administrative limits (4,956 sq. km.). This is due to the difficulty of classifying ifiixed or bilingual peoples and to the frequent unreliability of the statistics collected in a region occupied by hostile nationalities. In the census of 1910 the Italians numbered 147,388, the Serbo-Croats 167,966, the Slovenes 55,407, the Germans 13,279, the Rumanians 883. But these figures include only Austrian subjects; thus the 147,388 Italians rise to 153,415 if we add the 6,027 citizens of the kingdom of Italy who inhabit Istria. On the other hand, the number of Germans would be reduced to less than a third if we excluded the garrison of Pola. These figures show, in any case, that in Istria no nationality predominates in a marked degree. It is, however, to be noticed, that in agriculture and economic activity the Italians have an importance out of all proportion to their numbers, so much so that a great many of the Slavs speak Italian. 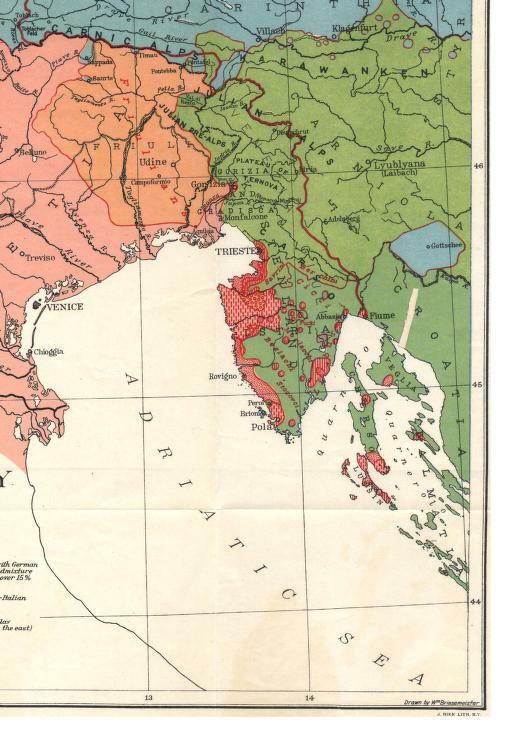 Trieste and Fiume do not form a part of Istria either geographically or politically. Trieste has administrative autonomy in Austria and Fiume in Hungary. The small territory included in these divisions^ — 95 square kilo- meters for Trieste and 21 square kilometers for Fiume — is in contrast with the size of their present economic hinterland, but it finds an explanation in the conditions of the past, which have their basis in the geographical position of the two cities. Trieste is not at the mouth of a valley, while Fiume is at the mouth of a valley of rather limited length and has behind it the Carso, which is here more impassable than at Trieste. The two cities were for centuries Adriatic ports, much like those of Istria in importance and presenting similar conditions of development. These two cities, as long as they mainly lived from the sea and in the days of small industries, sailing ships, and the old methods of land transportation, developed their economic activity within very narrow lines, which often did not pass beyond the bounds of their own hydrographic basin. So they had a limited importance. Nevertheless their Italianism, although scarcely felt in a nationalistic sense, was in no danger of extinction, because life on the shores of the Adriatic, which is so completely an Italian sea, could not but be strengthened by it. But in modern times these two ports became the outlets of large territories in the interior of Europe, extending far beyond the Danube. The two cities grew rapidly through the influx of inhabitants from near at hand, prevailingly Slavs, and from the more remote regions, Germans in the case of Trieste, and Hungarians of Fiume. To the natural development of this phenomenon we must add in the last decades the policy of the governments of Austria and Hungary, which was directed not only to developing these outlet ports but also to rendering less dangerous the singular state of affairs involved in the fact that the chief port of a state in which the German element dominates is in reality Italian and accessible only across more than a hundred kilometers of Slovene terri- tory and that the chief port of the other state, in which the Magyar element is supreme, is also Italian and accessible only across two hundred kilo- meters of exclusively Croatian territory. This policy has contributed to diminishing, though in slight measure, the relative numerical importance of the Italian element in the two cities ; but it greatly helped to give these Italians a strong sense of their nationality and to make Trieste the chief center of ''irredentism'' — ^that is, of the movement for the political reunion of the "unredeemed'' districts with the Italian fatherland. Only in the eighteenth century, and especially in the second half of it, did Trieste surpass in population the other cities of Istria — Fiume only in the nineteenth; but, except during the last twenty years, the growth of the two cities, despite the great prevailing influx of Slavs, was always less than the power of assimilation of the more intelligent native element. For instance, the 120,000 Italians in Trieste according to the census of 1910 doubtless cannot be regarded as descendants of the few thousand who lived there in the first half of the eighteenth century (3,865 in 1735). A large percentage of the population of Trieste, as is shown by the family names, is of Slav or German origin; another large number is due to the not inconsiderable immigration from Friuli or Venice. This influx, like that of the Slovenes, is explained by the modern industrial development of the city. In 1910, besides the 120,000 subjects of Austria, there were in Trieste almost 30,000 Italian citizens. Out of the 220,000 inhabitants of the city, the Italians represented three-fourths of the population, so that the 60,000 Slovenes, who live chiefly in the suburbs, and to a still greater extent the 12,000 Germans, represented minorities only. At Fiume in 1910 the Italians, including those born in Italy, represented little more than one- half of the population, which numbered about 50,000 ; yet even numerically they formed the dominant element, as compared with 15,000 Slavs and 6,500 Magyars. It is in the presence of these newcomers that the people of Trieste and Fiume felt their allegiance to Italy all the more, though at first but weakly ; but in Istria this allegiance has always been deeply felt, if only in the form of devoted attachment to Venice. The old County of Gorizia represents a fragment of Friuli which a feudal family in the Middle Ages succeeded in detaching from it and which, as we have seen, later passed to the House of Habsburg. Under the name of County of Gorizia and Gradisca it forms a province by itself. It includes, besides a piece of the Carso behind Trieste and the valley of the Vippacco (German, Wippach), which separates the Carso proper from the high Carso (the plateau of Ternova), two principal geographic regions: the valley of the Isonzo and the eastern part of the plain of Friuli. The limits of this province towards the kingdom of Italy are most unnatural; the most unnatural section of the boundary is that which runs through the plain and which is for the greater part defined by the little river Judrio. This was the limit of Venetian Lombardy as long as this region belonged to Austria, and it represented a rectification of a still more complicated boundary which for centuries limited the Republic of Venice on the east. On both sides of this frontier are to be found not only the same physical and economic conditions, but also the same Italian population, which extends compactly to the foot of the Carso. Here there is no question of a mixed population as in Istria, because the separation between the Italian plain and the Slovene mountain district is almost everywhere clean-cut. As was shown above, the Slavs had also established themselves in some parts of the plain of Friuli, but here the Italian population quickly re- gained the lost territory, and for centuries the ethnographic has coincided with the geographic boundary. Kather than a mixed zone, there could be distinguished one in which the Slavs, who were in close relations with the Italian centers at the foot of the mountains, were compelled to speak, beside their own dialect, that of Friuli. Within the confines of the County of Gorizia and Gradisca (2,918 sq. km.) the census of 1910 showed 90,181 Italians (Friulians and, at Monfalcone, Venetians), to which must be added 8,947 Italians born in Italy, while there were 154,537 Slovenes and 4,481 Germans. It must be noted here that the Slovene area of the County of Gorizia, while it continues on one side into Carniola and into Carinthia, on the other side includes, in the province of Udine, a territory consisting in large part of valleys which send their waters into the Isonzo and which have easy communication with this river. These Slovenes of the province of Udine, according to the census of 1911, numbered 31,730, to which must be added 4,650 Eesians, who inhabit the valley of Resia in the basin of the Taglia- mento and speak a dialect which seems to be related to Serbo-Croat. These Slovenes of the province of Udine do not anywhere, as they certainly did in the past, reach the plain and still less the Fella valley, along which run the frequented highway and railroad via Pontebba, while in the mountain- ous region where they have persisted, even if they are distinguished by their origin and dialect from the people of Friuli, they nevertheless, like them, regard Italy as their fatherland. The upper valley of the Fella, on the other hand, is still subject to Austria as far as Pontafel, and throughout its small area of 220 square kilo- meters presents a singular succession of German villages alternating with Slovene villages. A little more than half of the entire population, which does not amount to more than 4,000, is Slav; a little less than half is German. It has been shown elsewhere how in this region German coloni- zation has been superimposed upon that of the Slavs, as is the case through- out Carinthia, of which the upper Fella valley forms a part. The valley of the Fella, belonging to the basin of the Tagliamento, is the only valley south of the watershed where for centuries Italians, Germans, and Slavs have lived side by side. The Slavs once extended west as far as the sources of the Eienz (south of Toblach) but left their only trace there in the place names; so that today to the west of the Fella we find only superimpositions of the German element directly on the Italian. These superimpositions took place during a long period of time, but the ethno- graphic situation today is substantially the product of the eleventh to the fourteenth centuries, during which German colonization, favored by the foreign lords, became possible because extended tracts in the Venetian mountains were sparsely populated, while they were rich in unexploited minerals, forests, and pastures. Small German groups crossed the Carnic Alps, entering the upper basins of the Tagliamento and of the Piave (the villages of Timau and Sauris in the former and Sappada in the latter, with a total population of less than 3,000, are still German), but the main channels of German penetration south of the watershed led along the upper forks of the Adige, which continue the lines of easiest communication between Central Europe and Italy. These lie over the Brenner (1,362 meters) and the Toblacher Feld (1,208 meters). The German coloniza- tion, though intense, was practically confined within the principal valleys, so that in the higher and more remote valleys the original Ladin population was able to persist for a long time, in some cases even to our own day. Hence beside the Val Monastero (Miinstertal), which is connected with the basin of the Adige but is politically a part of Switzerland, the Val Gardena (Grodnertal), an eastern tributary of the Eisack, is also Ladin, as well as the valleys of Marebbe (Bnneberg) and Badia (Abtei), both of which send their waters to the Rienz. In the lower part of the valley of the Adige the German infiltration was stopped by the presence of a more numerous Italian population, and here, between Bozen and Salorno (Salurn) lay a zone of contest between the two populations — a contest which still continues. But this did not prevent German colonization from thrusting small units much farther south, even to the Pre-Alps, in sight of the Venetian plain; but here, contrary to what happened in the upper Adige region, the Ger- mans did not maintain themselves in the main valleys, but settled in the higher tributary valleys and on the table-lands. This is the case with the isolated German colony of the Mocheni in the valley of the Fersina east of Trent and with the Germans of Luserna, on the Austrian side of the plateau of the Sette Comuni. The whole plateau was once populated by Germanic peoples, but they are today in great part Italianized — the number of Ger- mans in the Sette Comuni being only 2,800 in 1911 — as are also almost all the inhabitants of the Tredici Comuni north of Verona, where in 1911 German was spoken by only 170 persons. While the ethnographic conditions of the Adige basin and the adja- cent regions are largely due to the immigration of the period prior to the fifteenth century, yet many changes have taken place since, even down to our own time. On the one hand the Italianization of the more advanced German centers has made progress; on the other the Ladin element has become in most cases Germanized or is now becoming so. The latter phenomenon is due not so much to inferior civilization as to other circum- stances. The region about the headwaters of the Adige, once Ladin, lost its original character, not only through frequent contact with the German element but also because in the seventeenth century the local dialect was forbidden in order to prevent the spread of Calvinism in the Tyrol from the Engadine. On the other hand, with the change in the suitableness of a terrain to communication which modern progress in methods of transpor- tation has brought about — a change which led to the abandonment of the uplands and divides formerly favored for secondary routes and the selec- tion of the valley trenches, even when narrow — the elevated tracts and high tributary valleys populated by the Ladins partly lost contact with each other and established closer relations with the inhabitants of the deep main valleys. In general, they were no longer able to maintain the isolation which for centuries had preserved their characteristics. Another contribu- tory influence to this result was the passing of tourists, who were in great part German. We are now referring to the Ladins in the Dolomites. By means of the schools and an intense propaganda organized by Austrian and German societies for the diffusion of the German language and influence, these Ladin populations are drifting away from their natural cultural affiliation, without making any appreciable resistance. As has been pointed out, the zone for the possession of which the Italians and Germans have most contended and still contend has Bozen for its center and extends from Meran to Salorno. The valley of the Adige lies at a rather low elevation at this point (Meran, 301 meters; Salorno, 224 meters) and especially in the section above Bozen is well protected from north winds, has a limited rainfall, and enjoys a climate which permits the culture of the vine and of the mulberry, thereby making this the region in which Mediterranean vegetation and cultivation penetrate farthest into the Alps. On the racial distribution this fact has had two opposite ejffects: it has favored the inflow of Germans to certain centers as health and summer resorts, on the one hand, and, on the other, the immigration of cultivators from the Trentino into the rural districts. This last phenomenon arises from two causes: the Tyrolese have less experience than the people of the Trentino with intensive agriculture, and the latter, because of the economic conditions in their own district, have been compelled in the last decades to emdgrate in large numbers, some going to distant America and others to the neighboring regions of the Tyrol and Vorarlberg. The 17,182 Italian immigrants from Austria listed in the United States census of 1910 under ** foreign white stock'' were almost all from the Trentino. Through Bozen and the valley south of it passes the Brenner highway. Hence, the development of this center and of the region tributary to the highway always reflected the fluctuations of commerce and industry, which, in the past, have favored the influx now of Italians, now of Germans. Since the construction of the railroad the latter have had a distinct advantage. The conditions of the Italian element between Meran and Salorno have, therefore, been quite varied ; of late, the Italians have tended to increase in the country and to decrease in the cities and towns. However, when we pass from this disputed territory and enter the high, tributary valleys, the upper Adige district is almost entirely German, whereas the Trentino is almost exclusively Italian. The Alto Adige district, i. e. the basin of the Adige above Salorno (7,178 sq. km. ): this district includes the administrative divisions, called political districts, of Bozen, Brenner, Brixen, Meran, and Schlanders.If we depend upon the Austrian census of 1910, which certainly is inexact but for which it is difficult to find any substitute, was inhabited by 215,345 Germans and 16,510 Italians. Even if this last figure ought to be doubled or tripled in an impartial reckoning, and with the addition of those born in Italy, the Italian element would still form a small minority. In the Trentino (6,356 sq. km. ), still according to official figures, the Italians, exclusive of those born in Italy, numbered 377,039, the Germans 13,477; but this last number would be reduced to less than half if the members of the garrisons and the government employees were excluded. The Trentino, besides the middle section of the Adige basin between Salorno and the Italian frontier includes Giudicaria, i. e. the basin of the upper Chiese and the Sarca, with a part of Lake Garda; the Valsugana, i. e. the upper Brenta valley; and the regions around the sources of the Astico (Lavarone), of the Cismone (Primiero), of the Cordevole (Livinallongo) and of the Boite (Ampezzo). The two last regions, corresponding to the political district of Ampezzo (390 sq. km., 6,674 population), because of their history and their geographic conditions, are considered to be outside of the Trentino proper. The population speaks a Ladin dialect strongly affected by Venetian. In the Dolomites it is the district most frequented by foreigners ; this explains why in the census of 1910 we find 443 persons who speak German. Though the Trentino does not represent a complete geo- graphic unit, it possesses an individuality of its own, if only by contrast with the upper Adige district, in population and physical and economic conditions. The tree culture of the Italian plain and hills is widespread here, and around Lake Garda even the olive grows. Toward Italy are directed the aspirations and interests of the Trentino. In earlier centuries this difference between the upper Adige and the Trentip^ was recognized politically in the independence of the episcopal principality of Trent, which lasted until 1796 and, though with a few varia- tions in the boundary, embraced almost all the racially Italian area. Yet no account was taken of this difference by Austria in the present system of administrative divisions. In this the Trentino forms, together with the Tyrol, a single province (i. e. the County of Tyrol and Vorarlberg) whose government is in the main entrusted to the German majority. For, accord- ing to the census of 1910, in the total population of 1,049,169 the Germans numbered 651,858, the Italians 391,557. The struggle of the latter for their liberation from the Austrian yoke assumed, then, not only the form of irredentism, or return to the Italian fatherland, but also agitation for administrative autonomy, or separation from the German Tyrol. Notwithstanding the legitimacy and legality of this demand, it was never heeded by the Austrian government. The Italianism of the Trentino, in culture, in tradition, and in sentiments, has been splendidly demonstrated not only in the daily opposition to the arrogance of the central and provincial governments and to the invasion of the German element, abetted by the Pan-German societies, but also in the support of schools and other cultural agencies through which even the lowest classes of the people tried to strengthen their Italian allegiance, even to the point of purging their dialect of the slight traces of German which had crept into it during the centuries of commercial relations. Thus their aspiration grew continuously to free themselves from the double yoke of their forced membership in a foreign state and their administrative association with real enemies. It is not out of place to recall here how the struggles undertaken within the sphere of Austrian law by Italian subjects of Austria, for the autonomy of the Trentino, for an Italian university in Trieste, and for many other ideal and material interests, had little effect, inasmuch as they were strenu- ously opposed by an always hostile government. This is because, while in the Adige region the Italians were in open opposition to the Germans, in Julian Venetia they were confronted chiefly with the Slavs; so that they did not have the support even of the latter, who ought to be, as they now are, their natural friends. When we turn from the territories subject to the Austrian yoke to con- sider Switzerland, the problems of the contact between the Eomance and Teutonic peoples present themselves under quite different aspects. Two contact zones should be distinguished, a longitudinal, running east and west, along which Ehaeto-Eomans and Italians abut against Germans, and a transverse, running north and south, along which French peoples face the Germans. In the latter zone the German element comes into contact chiefly with populations whose dialect belongs to the Franco-Provencal group and whose written language and culture are almost completely French. The ethnic boundary was more subject to successive thrusts toward the west, the chief of which occurred before the year 1000. The French element strongly resisted this movement at various times, but it has resisted it especially in the last decades. The ethnic boundary between Germans and French lies not only in Swiss territory, but continues into Italian territory. Here, south of the Monte Eosa group the Germans in the valley of Gressoney (German, Lystal) are on the west in contact with Franco-Provencals of the valley of Aosta, among whom French holds first place in the church, schools, and in general culture. We also find Germans southeast and east of Monte Eosa in the upper Val Sesia and its tributaries (Alagna, Eima, and Eimella) and in the valley of Anzasca (Macugnaga). Gondo (G., Euden) and Simplon (Simpeln) are also German; although on the southern side of the Alpine watershed, they belong politically to Switzerland. In Italian territory the valley of Formazza (G., Pommat), i. e. the uppermost valley of the Toce, and, in the Swiss canton of Ticino on the other side of the crest which encloses the valley on the east, Agaro and Bosco (G., Gurin) are likewise German. It is probable that these German centers, which today number, all told, about 5,000 inhabitants, were in the past more numerous, but the more advanced of them, like Ornavasso on the lower Toce near Lake Mag- giore, have not been able to avoid the assimilating influence of the more numerous and cultured Italian population, and this influence still continues in force. Taken together as a unit, the Germans of these wild Alpine valleys form a wedge whose apex, at Issime,^ is thrust forward to within 20 kilometers of the Po Valley. This wedge completely separates French Switzerland from Khaeto-Romanic Switzerland, which includes almost all the valleys of the uppermost Rhine and Inn basins and the Val Monastero, already mentioned, all, except the last, lying north of the Alpine watershed. The watershed separates this valley from the rest of Rhaeto-Romanic Switzer- land and puts it in more direct and intimate relation with German Tyrol. The condition of things as here set forth explains why the Rhaeto- Romanic people of the canton of the Grisons do not consider themselves Italians, as do the Ladins almost everywhere else in the Alps. The Rhaeto- Romanic people have tried to raise their dialects to the dignity of literary tongues, though with little result. This effort has hardly passed beyond the most elementary stage, for their culture is German and is growing increas- ingly so not only through the influence of the schools but also through commercial relations and the flourishing foreign tourist trade. The Rhaeto-Romanic people of the Grisons could not look toward France, from which they are separated by too wide a German zone, nor towards Italy, from which they are cut off not only by the main divide of the Alps but also by differences of religion (they are largely Protestant) and feeling. In their inability to create for themselves a real language and a culture of their own and in their reluctance to adopt that of one of the great Latin nations, many students of the question see their weakness and fear their early disappearance. Indeed the colonization by Germans of some of the valleys of the upper Rhine in the Middle Ages already at this time interrupted the continuity of the Rhaeto-Romanic territory. Furthermore, in many centers of mixed population, especially those on the floor of the main valleys, the German element has been increasing of late as a result of the growth of commerce and the influx of German travelers. The very favorable climate, both in summer and winter, of the Engadine, for instance, has made it and its center, St. Moritz, one of the most famous health and winter-sport resorts in the world. St. Moritz is frequented especially by Germans. In the commune of issime the subdivision of Issime St. Jacob is German in speech while that of Issime St. Michael is French. In the schools Italian and French are taught, as in the other communes of the District of Aosta. The growth of the tourist trade has not caused any falling off in the old tendency of the natives of the Engadine to emigrate, usually for part of the year, to various parts of Europe. The canton of the Grisons also includes, south of the main Alpine water- shed, territories with Italian populations (in all less than 10,000 people). These are the Val Mesocco and the Val Calanca, whose waters flow first into the Ticino and then into Lake Maggiore, and the Yal Bregaglia and Val di Poschiavo, whose waters reach Lake Como through the Mera and jthe Adda, These form a part of so-called Italian Switzerland, which includes, in addition to these three little pieces of the canton of the Grisons and a small piece of the canton of Valais (the upper valley of the Diveria near the Simplon Pass), the whole of the canton of Ticino. Italian Switzerland is lacking in geographic unity as well as in political unity. The territory itself of the canton of Ticino (2,801 sq. km.) is an aggregation of very different parts, with limits which cannot but appear very strange, especially where they include half of Lake Lugano, leaving on one of its shores, as an exclave in Swiss territory, a small area belonging to Italy (Campione). The canton of Ticino, like all of Italian Switzerland, is, in fact, conquered territory. When the strategic importance of the relevant passes is considered — Simplon, St. Gotthard, Lucomagno, San Bernardino (connecting the Val Mesocco with the Rheinwaldtal), Maloggia, Muretto, and Bernina^ — it is easy to understand why Switzerland strove to possess them. The consequent extension of Swiss territory encompassed areas purely Italian not only in population but also in type of cultivation. On the Swiss shores of Lake Lugano and Lake Maggiore the vine and mulberry and in some places even the olive flourish. The districts constituting the present canton of Ticino were severally joined to Switzerland at various times and were variously governed, but always as conquered territory, until 1803, when the Ticino became an independent state of the Confederation. The population (160,680 in 1913) is altogether Italian both in dialect and culture and, moreover, is attached to Italy by strong economic inter- ests; but it is much more closely attached to the Swiss Confederation because of the great political liberty granted by its constitution ; so there is no marked tendency to reunite this region with the rest of Italy. More- over it should be remarked that, while the canton of Ticino has furnished a considerable emigration, especially to the United States (the census of 1910 enumerated 14,923 Italian Swiss), it has experienced an intensive agricultural colonization by Lombard peasants, so that half of the present population of the canton is estimated to consist of families born in Italy who have established themselves there in the last fifty years. Then, too, the region, like almost all of Switzerland, is subject to an intense temporary immigration of Italian workmen and day laborers, who spend the working season there and return to their homes for the winter. Indeed, this periodic migration affects all the countries which border on Italy. In the western Alps there is no clean-cut boundary between the dialects which may be called Italian and those which should be regarded as French ; in most cases only a trained philologist could decide whether certain valleys or districts ought to be placed on one side or the other of this boundary. It appears upon examination that, along the Eiviera, the dialect spoken at Mentone is Provengal, while at Ventimiglia it is still Ligurian ; so that the political boundary of Italy at this point does not diverge much from the dialectal boundary. In the Alps of Liguria and Piedmont, however, the Provengal and Franco-Provencal dialects occupy all the upper valleys of the tributaries of the Po, in some places even approaching the plain, where Gallo-Italian dialects are spoken, which represent a transition between the Italian and French dialects. The Italian literary language and culture, equally with the French, found a soil favorable for development among these different populations. The preference for one language or the other in a given region was usually dependent on its political affiliation or other historical vicissitudes. Hence, the boundary between the Italian and French literary languages does not coincide with that between the Italian and French dialects. From the last Italian census (1910) we can learn, not how many people speak the Provengal and Franco-Proven§al dialects within the Italian boundaries, but only how many of them use French as the language of the church, of the school (where it is usually spoken along with Italian), and of culture in general. The census shows that 70,560 inhabitants of the administrative district of Aosta spoke French. In the valley of Aosta, Italy has actually kept French in the elementary schools, and in the churches French is used. In the Susa district there are 7,070 French in the villages of the upper Dora Eiparia valley; this area is one of the territories east of the Alpine watershed which was longest under the rule of France (until the Treaty of Utrecht, 1713), and with France, too, it was further related by cultural and commercial contact through the Mont- Genevre Pass. Next to the south lie the valleys of the Chisone and the Pellice, which are inhabited by the Waldensians, the well-known Protestant sect, which, after many persecutions in the Dauphiny and in Savoy, found a final refuge here. According to the census of 1910 there were 8,330 French-speaking people in the administrative district of Pinerolo, which includes these valleys. The dialect of the Waldensians is Provencal, differ- ing, however, from that of the adjoining regions because the Waldensians came from the Dauphiny and settled in the territory which they now occupy only in the Middle Ages. The official language, as well as that of their church and culture, is French. It is important to remark that the official language of the Waldensians was Italian until they had to call in the services of pastors from Geneva, because almost all their own native pastors had fallen victims to the pestilence of 1630. The French literary language was thus introduced. It has since flourished because it conformed more closely to the character of the local idioms, but especially because it became, as it were, the symbol of their spirit of rebellion against the Church of Rome. While the French- speaking persons in the district of Pinerolo number 8,330 according to the Italian statistics, the Protestants of the same district, i. e. the Walden- sians, number 14,841; the difference indicates that the Waldensians are largely bilingual. The total number of Waldensians is, however, much greater than these figures indicate, for they do not include the numerous colonies of that sect in Italy, elsewhere in Europe, and in the western hemisphere (especially in Uruguay). While some populations with Provengal and Franco-Provengal dialects and often even with French language and culture are thus included within the political boundaries of Italy, there are some populations with Italian dialects and Italian culture within the territory of France. To be sure, the only popu- lations in France with Italian dialects are the inhabitants of that section of the middle valley of the Roia which, being included in the old County of Nice, was detached from Italy in 1860, when this county was ceded to France. Nice, with a good part of the Nice region, including also the principality of Monaco, was at that time prevailingly Italian in language and culture. But gradually, as the ''Cote d'Azur,'' or French Eiviera, has become one of the most frequented winter resorts of the world, the old traditional culture has grown weaker and in some places has even disappeared, so that the whole region, including Nice, the birthplace of Garibaldi, has become almost entirely French. The old character was but little fostered by the modern stream of Italian immigration to this region (the Italians number 30,000 in Nice alone). Beside the Cote d'Azur other centers of the south coast have been affected by this immigration, especially Marseilles, where there are about 100,000 Italians who were born in Italy. But their influence was much less than the number would indicate, because for the most part their sojourn is temporary and they belong mostly to the laboring and servant class. This Italian migration into southern France, in its causes and its character, is of exactly the same type as that to Switzerland, Trieste and Fiume, and Austria-Hungary in general. The consequences of this migra- tion, while identical in their influence on the economic and social conditions of the countries bordering on northern Italy, are very different in their effect on the spread of Italian culture. The Italians who change from temporary sojourners into permanent inhabitants of the countries which receive them are quickly assimilated in France, while in Italian Switzer- land, in the Trentino, and in Julian Venetia they go to swell the Italian element and the strength of its resistance against the foreign elements. The ethnographic and political consequences of this modern migration of Italians, which has taken place on so large a scale to the New World, within Europe itself, and to the Mediterranean countries, are not all evi- dent, nor is this the place to consider them.